Gable vents are extremely valuable as they function as both the air intake and exhaust usually located near the gable (or peak) of a roofline. They ensure adequate venting of the attic, extending the lifespan of the shingles and roof. Material choice matters for both durability and looks. Utilizing a copper gable vent is a smart way to prolong the lifetime of the vent itself, needing far less replacement than traditional ones. With copper’s ability to outlast aluminum and plastic materials, it makes sense why more and more people are choosing a higher-grade product that is able to withstand the harsh outdoor elements, making copper’s durability highly desirable. Dual functionality is another advantage of copper vents, as they have the added benefit of looking great and serving a long-lasting purpose. Since exterior vents are often visibly seen, it’s important to consider the visual aesthetics when choosing these types of vents. It’s no ordinary vent; it adds a touch of architectural interest and detail. More specifically, copper vents won’t rot, rust or crack like other materials have know to. Their ability to outlast (and outshine) any plastic, or white vent is one of the fundamental reasons that the popularity of copper vents have skyrocketed. An added bonus benefit is the minimal, or non-existent, maintenance that they require. The copper will patina over time, creating a unique, classic look. Or if one prefers to preserve the shiny brightness, it can easily be polished or cleaned to restore its original color back to new copper. Either way, both looks will never go out of style! Countless people are painting their vents copper, but without the true copper material underlay. They are seeking the look without the costs associated with it. They will learn the hard way that there are no shortcuts in creating a visually appealing product that is backed by the durability that only a strong copper material can provide. Don’t try and fool anyone, get the real deal that will last and looks great! Shop now! Our heavy-duty 16 oz. 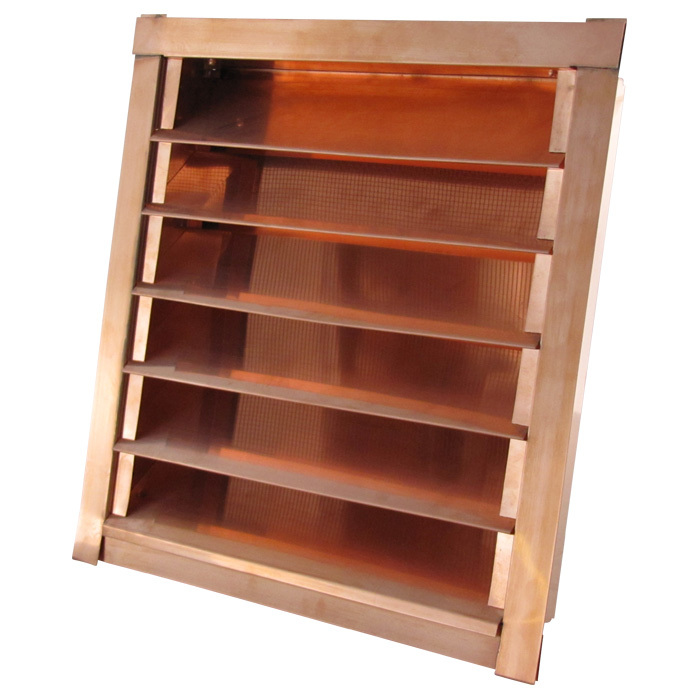 copper gable vents work well with strong winds to provide both intake and exhaust functions. It is not recommended to face directly on a side where it rains on a continuous bases. The angles of the louvers prevent direct sunlight from penetrating in as well as acts as a sound barrier. Our high-quality vents are great on keeping the elements out while still allowing air to flow through with ease. We offer three types of mounting options to fit your needs. Either flush, recessed, or flanged on back. All come with 1/8 of an inch screen keeping insects and unwanted animals out. There are 8 different dimensions to choose from reassuring there is the proper amount of louvres. Each appropriate size provides a decent net-free area which should help to meet specific code requirements. They’re easy to install on wood, vinyl, brick or stucco exterior surfaces and comes with our standard 1-year manufacturing warranty. Please refer to our specs chart to make sure these square or rectangle gable vents will be the right fit.